Congratulations to Private Pilot Student Himalay Jariwala for accomplishing his first solo flight at KCDW – RWY 22!!!! Great work Himalay! WOOT! WOOT!! WOOT!!! Fischer Aviation is so proud of CFI David Ayoub for passing his instructor check-ride today. 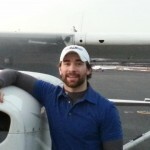 David will now begin his flight instructor career here at Fischer Aviation, and we wish him the very best! Another big congrats to CFI David Pavoni for his instruction and training of CFI David Ayoub. We are so impressed with both of them!!! Congratulations AND Happy Birthday to Fischer Aviation’s newest Private Pilot Sanjay Jain!!! Sanjay passed his FAA check ride today, and he did fantastic! CFI Tom Fischer could not be more proud. Sanjay, you are truly a complete pilot. A Date in the Sky! Private Pilot Student Thomas Lepree First Solo! Congratulations to Private Pilot Student Thomas Lepree for making his first solo flight this afternoon in Cessna N811JD on RWY 22 at KCDW!!!! Thomas’ CFI, Dave Pavoni, says every pilot remembers their solo and the excitement of piloting without an instructor for the first time. Hard work does pay off my friends, keep it up!!! Private Pilot Student Sam Chanowich First Solo! Congratulations to Private Pilot Student Sam Chanowich for making his first solo flight this afternoon in Cessna N5253R on RWY 22 at KCDW!!!! After taking the hectic rush hour pattern in stride, Sam took over as pilot in command for his first solo flight. Proudly wait on the ground as each of their students perform simultaneous solo flights! CFI Dave finally got it to say ZERO!!! Kurt Bennett back from taking his first flight lesson yesterday with CFI Dave in Cessna N5253R!